Chelsea eased to victory over Southampton at St Mary’s, with the win keeping the pressure on Premier League title rivals Liverpool and Manchester City. Ross Barkley assisted his first goal in 18 months, playing in Eden Hazard for the Belgian’s seventh league goal of the season. Barkley then got his own name on the scoresheet, meeting an acrobatic attempt from Olivier Giroud that was going wide to double the advantage. Southampton tried to hit back and weren’t without their threat, but they left themselves vulnerable to the counter-attack and substitute Alvaro Morata wrapped up the three points in stoppage time with his first league goal since netting against Arsenal in August. Head coach Mark Hughes made three changes from the Saints’ 2-0 defeat to Wolves. 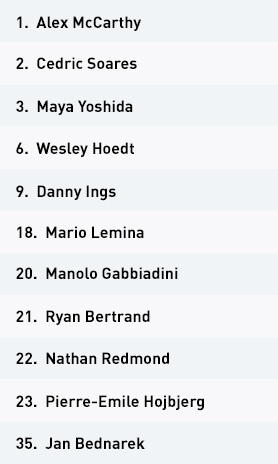 Moving away from a 4-4-2 to a 3-4-2-1 structure, the manager introduced Jan Bednarek and Maya Yoshida to form two parts of his back three, while Manolo Gabbiadini was selected in attack. Jannik Vestergaard and Charlie Austin dropped to the bench, with Mohamed Elyounoussi left out of the squad entirely. Southampton struggled to assert themselves in the game, as the visitors dominated the ball throughout the opening period. The width provided by Chelsea’s full-backs pegged back wing-backs Cedric Soares and Ryan Bertrand, as Gabbiadini and Nathan Redmond dropped deep within the central lane to form a defensive midfield diamond alongside Pierre-Emile Hojbjerg and Mario Lemina – making it difficult for them to break out during moments of transition.  The immediate pressing from Jorginho and N’Golo Kante forced the pair to pass the ball early out of the central space, usually looking for either wing-back to run on to the ball in the wide areas. 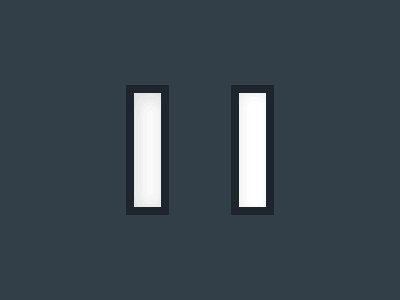 It was unrealistic to expect Cedric and Bertrand to make up the ground, however, given they had to consistently drop into a back five. As a result, Saints often lost possession almost as quickly as they regained it. It wasn’t until midway through the first half that they posed any real threat to the Chelsea goal. 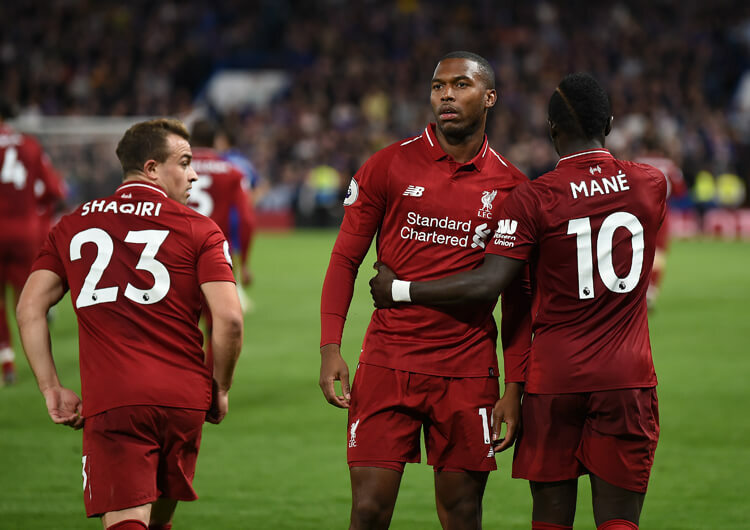 The high pressing run of Redmond encouraged his midfielders to apply more pressure on the Chelsea back line, and they began to regain possession in their attacking half. They made good use of the wing-backs in delivering crosses into the box, while the front trio of Danny Ings, Gabbiadini and Redmond managed to occupy the entire defence with intelligent positioning in between the Blues’ back four – although Ings struggled in the air against David Luiz and Antonio Rudiger. With Cesar Azpilicueta quickly closing down Bertrand, Redmond performed blindside runs to the wide left, providing his teammate with a passing outlet while simultaneously dragging a central defender out of position. Ings could then attack balls delivered into the box in one-on-one scenarios. The hosts were punished when Hojbjerg was caught in possession deep inside his own half, Eden Hazard comfortably breaking the deadlock after being put through on goal. Chelsea regained control, and their left-sided combinations constantly probed the right side of the Saints’ defence. Mark Hughes responded after the break by changing the structure of his team to a 4-1-4-1, with defensive midfielder Oriol Romeu replacing central defender Jan Bednarek. This shape increased their possession, as Hazard and Willian were unwilling to track the advancing movements of the full-backs. Redmond and Gabbiadini could then move into the inside channels and attack alongside Ings in a narrow front three. With Chelsea’s full-backs pressing in wide areas to stop Cedric and Bertrand from delivering crosses into the box, more central space was created for Ings and an attacking midfielder to move inside and shoot on goal. Similarly, when Jorginho or Kante moved to close down Gabbiadini or Redmond man for man within the inside lane, they were forced to leave their subsequent man free. Southampton could exploit this by utilising quick passing combinations to find Ings in front of goal or pass to the ball-side full-back. Chelsea’s second goal wiped all of the Saints’ progressive work with the ball. They responded by reigniting their attacking play, with Hojbjerg and Lemina surging forward after their passes, looking to help break their opponents’ central lines through one-two passing combinations. 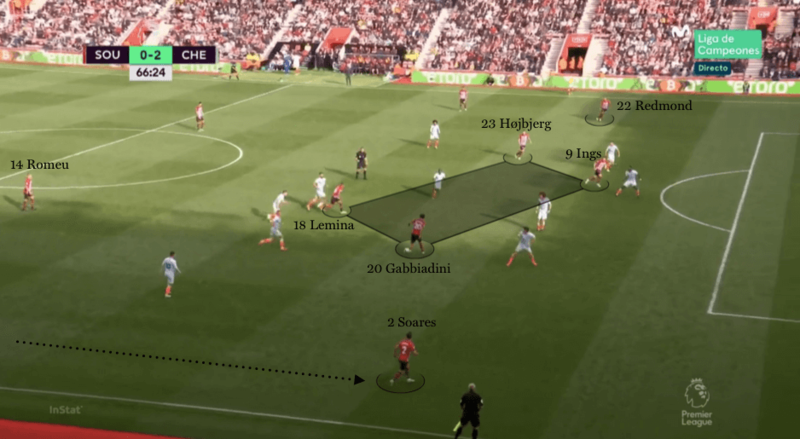 With the addition of Gabbiadini or Redmond coming inside to support the central midfield runners, they could overload the space between Chelsea’s defence and midfield, allowing for a more direct approach. They would send aerial passes into Ings; even if he didn’t win the first ball, there were enough bodies around the central lane to regain any loose ball. This resulted in more attempts on goal, and Redmond came close with a thunderous effort from range that was tipped on to the crossbar by Kepa Arrizabalaga. As Southampton set out to maintain possession, Chelsea looked to inflict further damage on the counter. Hazard’s link-up play eventually helped the visitors wrap up the points, as substitute Alvaro Morata grabbed a third goal deep into injury time – and inflict a third straight league defeat on Southampton. 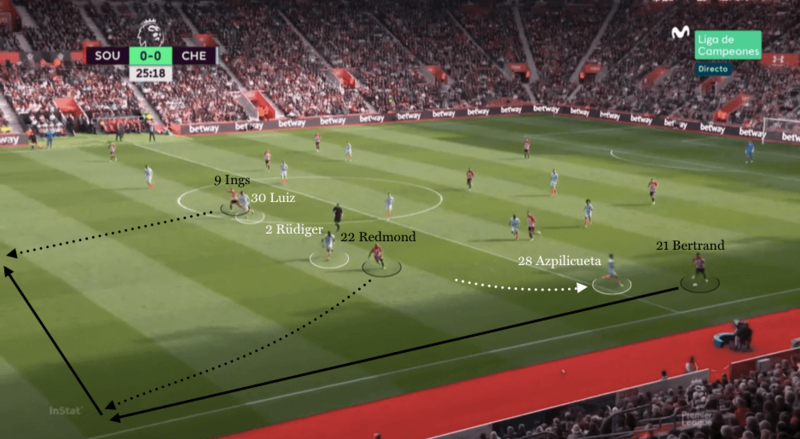 Cesar Azpilicueta’s pressing on Ryan Bertrand initially blocked Southampton’s left-sided crosses, but Nathan Redmond created a new angle for deliveries through smart movement. This allowed Danny Ings to attack the penalty area against only one centre-back, where previously he had been up against two. Southampton set up in a 5-4-1 when out of possession. 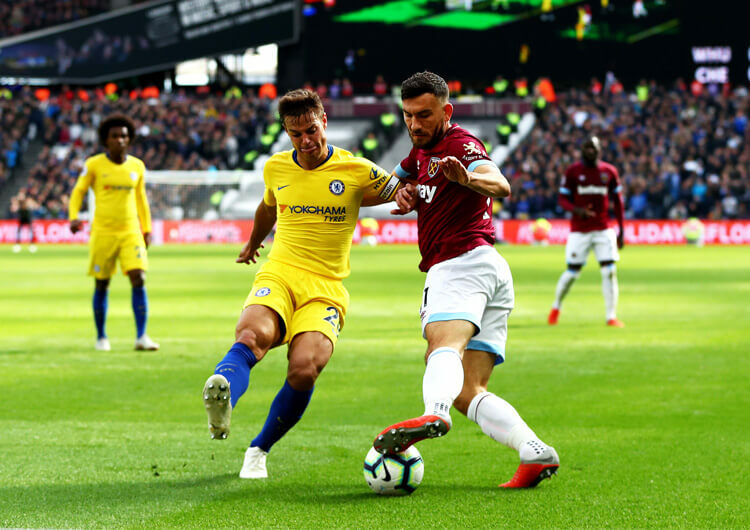 Bertrand and Cedric Soares dropped in from wing-back, and the hosts looked to create a four-on-three overload against Chelsea’s central midfield. Southampton changed to a 4-1-4-1 structure in the second half, with Oriol Romeu coming on for Jan Bednarek at half-time. The Saints tried to get numbers between Chelsea’s lines and became more direct with the ball into Ings. When Chelsea were in possession in the first half, Eden Hazard and Willian moved into narrow positions when supporting Olivier Giroud. In avoiding Southampton’s wing-backs, the trio could then attack the hosts’ back three in the central lane. Chelsea maintained their 4-3-3 structure when defending, but the inside positioning of Hazard and Willian made it easier for Southampton to progress into the final third when attacking in wide areas. 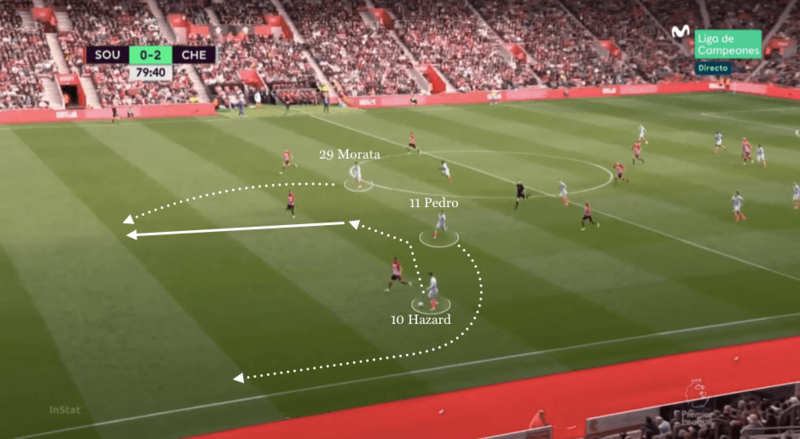 Chelsea’s approach became more transition-focused as Southampton pressed players forward, as they looked to utilise Hazard’s dribbling ability to make quick breaks. Ross Barkley replaced Mateo Kovacic in Maurizio Sarri’s only change from the home draw against Liverpool. Chelsea set up in their now familiar 4-3-3 system, as they looked to maintain their unbeaten start to the season. 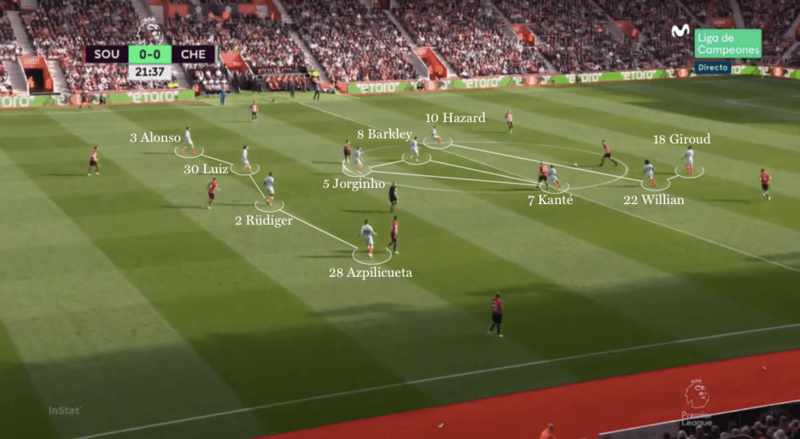 With Southampton setting up in a 3-4-2-1, Chelsea’s central midfield trio of Jorginho, N’Golo Kante and Ross Barkley were outnumbered three-on-four in the opening moments of the game. Eden Hazard and Willian soon moved inside to create numerical balance within the central lane, and this narrow front three could attack the Saints’ back three with Barkley and Kante supporting from deep to win any loose balls. Hazard was consistent in his movements infield to create a four-on-four, while Willian eventually moved back out to provide attacking width on the right. Marcos Alonso was in turn tasked with providing the width on the left; this balance was important in enabling Hazard to drift inside when the ball was worked into midfield. Southampton frequently had 10 players defending the spaces around the penalty area, as their low block became increasingly compact. This sustained spell of possession was soon thwarted by an increase in pressure from the hosts’ midfield, and they would have gone behind but for Danny Ings squandering an opportunity from close range. Chelsea withstood this pressure, though, and took the lead on the half-hour mark. Pierre-Emile Hojbjerg was dispossessed by Ross Barkley inside his own half, who slipped Hazard in on goal to break the deadlock. Chelsea regained control of the ball, as Willian and Hazard spent a brief spell together on the left. 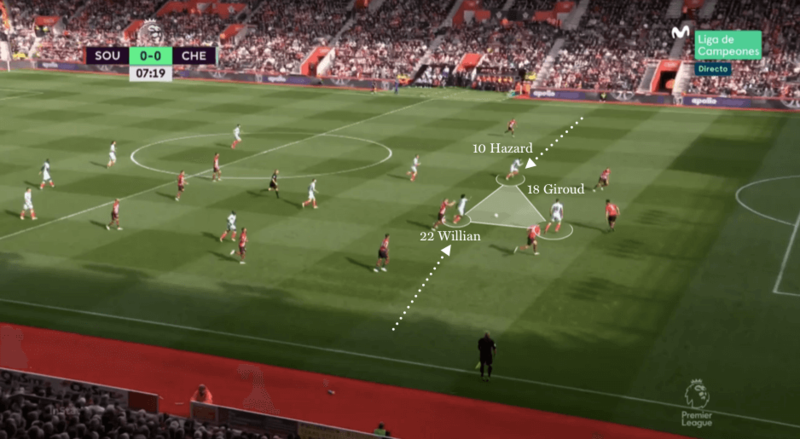 Willian’s wide positioning opened a passing angle to Olivier Giroud, and Hazard’s blindside runs created a first-time passing option for the striker, who could then work the ball around the Southampton central defence and in behind for the Belgian to run on to. 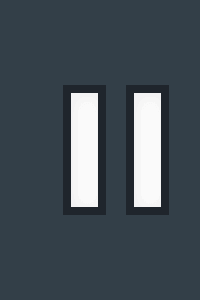 These left-sided combinations proved so effective that the hosts shifted entirely across to their right to deal with them. 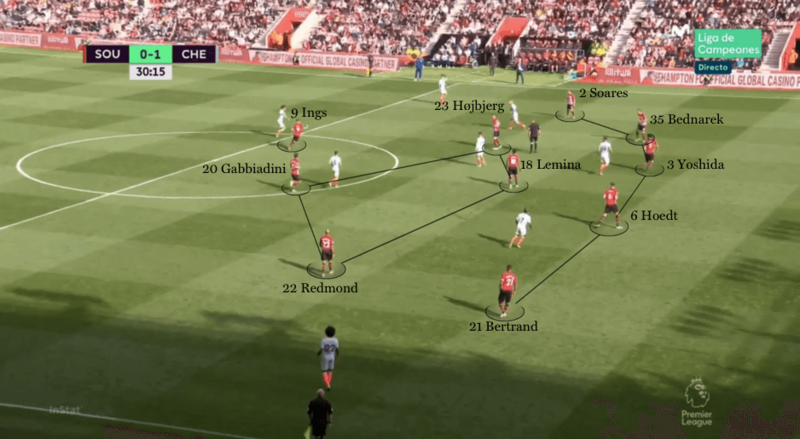 Southampton reacted by switching from their 3-4-2-1 shape to a 4-1-4-1, and Chelsea initially struggled to deal with the advancing movement of their opponents’ full-backs. 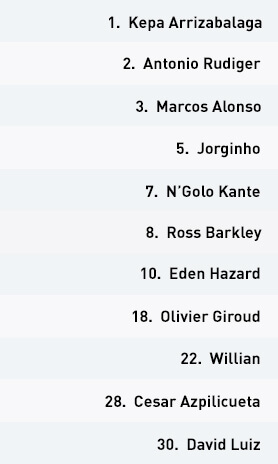 Willian and Hazard only sporadically tracked back to assist their own full-backs, while a subsequent narrowing of the Saints’ front three saw Antonio Rudiger and David Luiz frequently scramble to block any shots on goal. As in the first half, though, a Chelsea goal arrived at the perfect time; Giroud’s run around the back of the defence went untracked from a Willian free-kick, and the France international volleyed across goal for Barkley to tap home. But Chelsea’s second-half performance was, in truth, unconvincing. They lacked the urgency and one-touch passing combinations that had eluded their opponents’ press so effectively in the first half. Southampton’s higher starting positions on goal-kicks often forced goalkeeper Kepa Arrizabalaga to play long, and once Giroud had been replaced by Alvaro Morata, they lost their main aerial threat to win the first contact. When moments presented themselves to attack after the second goal, the tempo of their play was noticeably reduced. 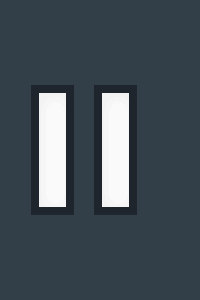 They repeated safe passes, switching the ball horizontally rather than exploiting the half-spaces with vertical passes forward. The introduction of Pedro, Morata and Mateo Kovacic resulted in a more direct and transitional approach, as they looked to burst forward from their compact defensive shape on the counter. Morata’s ability to hold the ball up during moments of transition was inconsistent, and the forward runners around him grew openly frustrated with his lack of ball retention. The Spaniard did manage to grab a goal late on, however, as Hazard’s link-up play between midfield and attack carved Southampton open. After being played through with only the goalkeeper to beat, the striker deftly lifted the ball over Alex McCarthy to wrap up the victory. 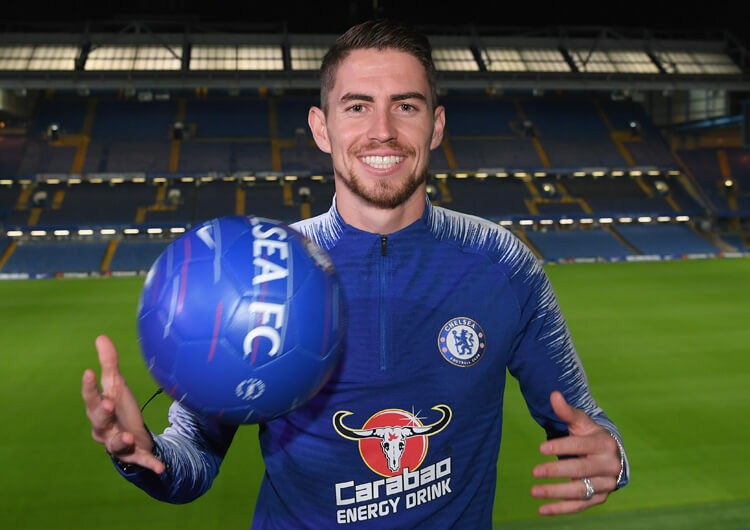 Despite rumours that he was to join Pep Guardiola at Manchester City this summer, Jorginho instead followed his old Napoli coach Maurizio Sarri to Chelsea – but how will the midfielder fit in at Stamford Bridge?